But my hearts keep calling me – ideas for new ones keep popping up. Every day I look forward to creating a new heart for myself and whoever is reading these blogs. And I find that focussing on the subject (self)compassion, makes more compassionate; I almost automatically become more aware, ask myself questions, question my behavior. In the running-up to A Heart A Day, I’d collected so many reasons not to start, telling myself I’d fail, wouldn’t be able to create something beautiful, wouldn’t finish it, etc. The typical daily prayer. But after months of brewing, contemplating and creating some hearts I told myself I would start anyway, give it time and be kind to myself no matter what the outcome. And time is of the essence here: allowing yourself time to try your hand at new things, allowing yourself time to practise self-compassion. Most things don’t change overnight, you know! That’s how I always hope it will be, but reality proves different. So I’ve given myself time this time ’round and – as if by magic – I’v been posting a heart a day now for 13 days without complaining or thinking of quitting. So yeah, today’s heart. It is a bit see-through, difficult to spot, as so is practise – in the beginning you might not notice results or change. Same for compassion. It needs practise. Warm-hearted practise. I’ve a fairly compassionate character, but I wanna up my standard especially on the self-compassion side of things. That needs repetition. And a lot of love! The hearts help me focus on my goals. Every day. And awaken my thoughts on compassion. Every day. Slowly. And that’s perfectly fine. P.S: can you spot the second heart in the picture below? Another day has come and gone. I’ve been drawing most part of the day, going up in a flow, being miles away. I guess it’s a form of meditation. When I’m there, there is no room for self-hate. It’s just me, creativity and a happy feeling. On days of creative flow I feel so at ease, contented. I feel like I can handle a lot more on such days. I’m so much kinder towards myself, others. Could that be one of the ingredients for a more compassionate attitude? Today’s heart I made on Saturday, when I was in a rainbow-heart mood. I hope you’ll enjoy it! [I love love and I love hearts! But oh, there’s too little of it, this world needs more love. So let’s change that, step by step. Away with pessimism. Away with hate. Let’s fill this world with love. And hearts. To show compassion towards each other, towards the planet, towards ourselves. It proves to be difficult for so many of us. But instead of judging it’s more meaningful to show love, to respond with love, to act out of love. Say it with hearts. Day #11. Today’s heart from me to you. Another rainbow coloured heart. Using pencils, fineliner and ruler. What are your thoughts on self-compassion? Are you as kind to yourself as you are to others? The way your mind speaks to you, would you accept that from anyone else? 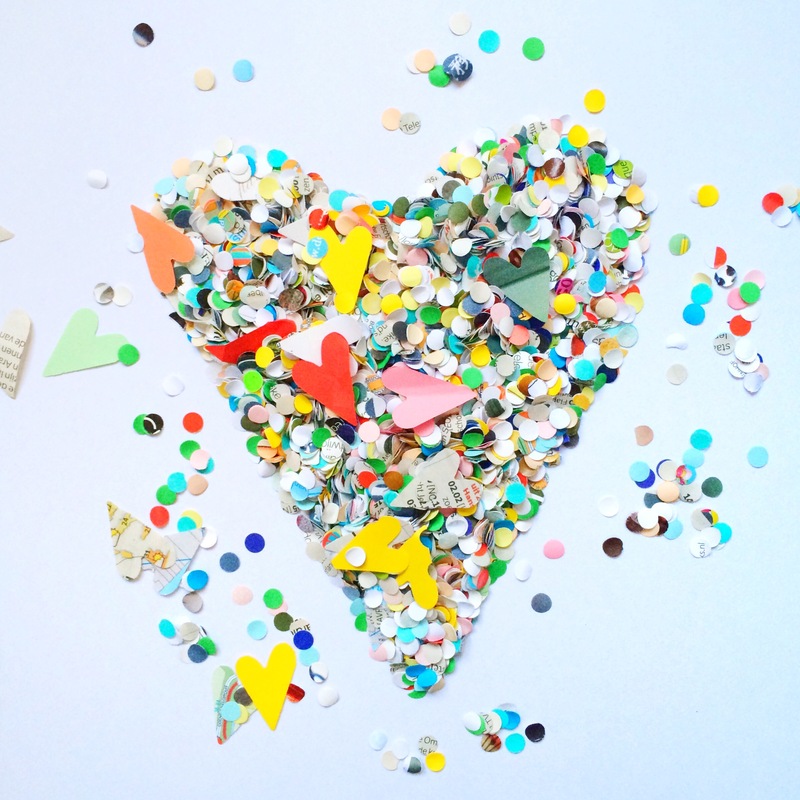 Share your thoughts and – if you wish – create a heart or take a picture of a heart you found. Use #aheartaday. It’s Gay Pride in Amsterdam, so for today’s heart from me to you I thought I’d stick to the colours of the rainbow. 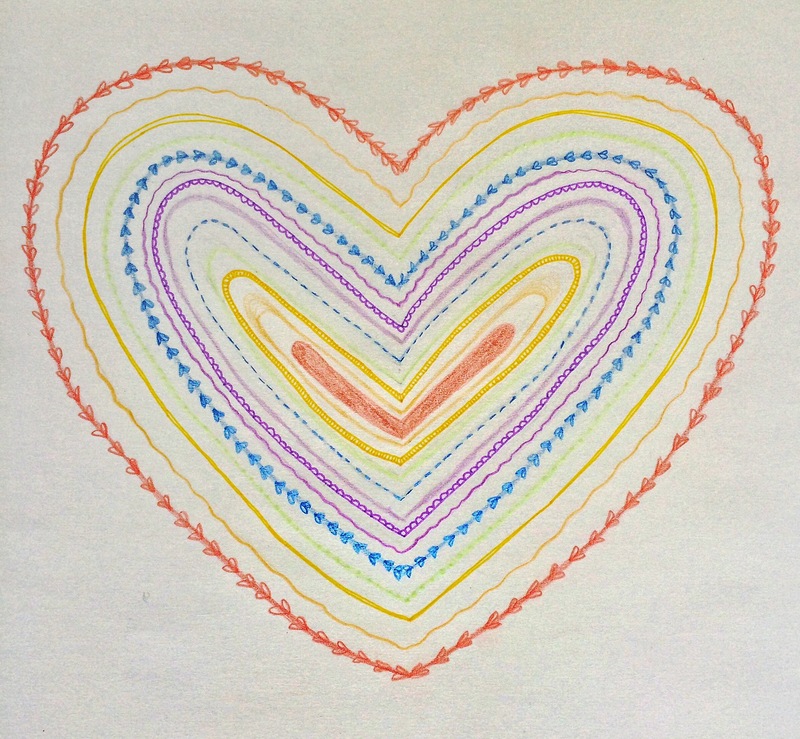 This heart turned into my morning meditation, then got me into a drawing-flow. Gay Pride and compassion are an interesting duo, I think. We celebrate that everyone has the right to be who he or she wants to be, no matter what sexuality. Pretty compassionate. Yet so many people have something to say about some other’s sexuality. Judgement seems to be around the corner. Especially on days like these. But what if all people judging others would start with themselves? If they would start to feel, listen to themselves. Would they maybe be surprised to hear a total new story, to see a whole new picture, that isn’t influenced by parents, friends, neighbours, isn’t influenced by someone else’s story and opinion? Would that make them more compassionate? In my ideal world, yes, it would. Heart #9 – Money heart, all in red. I’m thankful for all the money coming my way. It might not be much, but I’m thankful for every tenner I can fold a heart from ;-) “Money can’t buy love” they say. However, to me money means the ability of taking care of me, the ability of treating and surprising others. I think that’s love, don’t you? What is your heart made of today? Share your picture using #aheartaday and let’s fill this worldwideweb with love, compassion and self-made (or self-found) hearts! Be kind to yourself, you deserve a treat; this one life you, presumably, have…why be hateful to yourself and others, if all we are is human and we all have been given one life to live. Why not choose to spend time enjoying it, your life. It would be a waste to spend all your days being hard on yourself, judging others, comparing yourself to others. Why live a dissatisfied life if you could choose kindness? Treat yourself and others frequently; give away a smile, share your chocolate bar and do this consciously. You’ll get so much more in return.